This past weekend I went down to Christiansburg, VA, to visit my friends Caz and Scott. We had originally planned on meeting in Shenandoah National Park to do some backpacking. Then Old Rag Mountain came up and we all got really excited about that and decided to forego backpacking so we could car camp near Old Rag at Big Meadows. I was leaving Friday morning so we had a call Thursday night and decided the rain didn’t look too bad and it should still be clear on Saturday. Unfortunately, on Friday morning the forecast had gotten much worse. So it was decided I’d just go all the way down to them to check out an old timey music thing they go to sometimes at the Floyd Country Store, and to do a day hike they’d been wanting to try there. 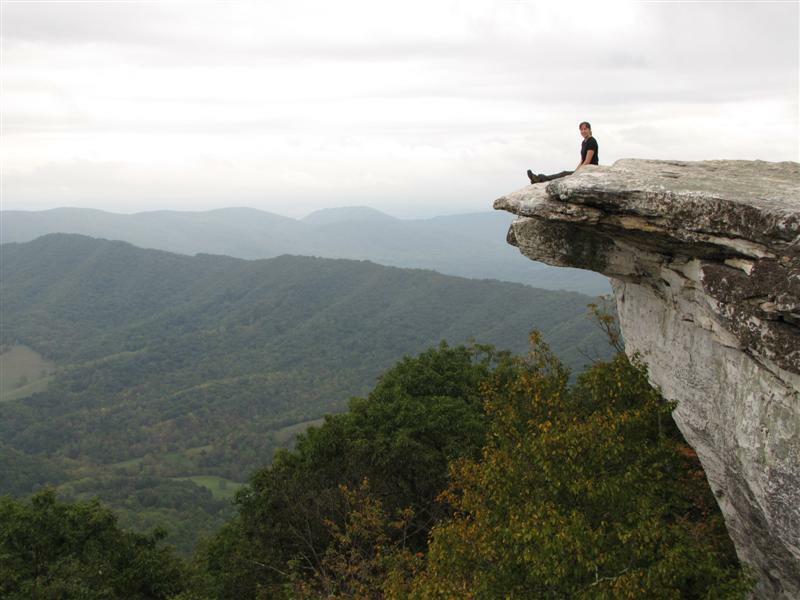 That day hike was to McAfee Knob on the Appalachian Trail. The only time I’ve been on the AT before (I think) was on a family hike several years ago in the Delaware Water Gap in North Jersey. We had hiked the Mt. Tammany section while camping at nearby Camp Taylor. I was excited to get back on the trail, as I had also read Bill Bryson’s A Walk in the Woods several years ago. My dad read the book first. I’m not sure where he heard about it but as he started reading, he would continually have to take breaks from laughing and read sections out loud to the rest of us. I read it shortly after that and have been generally fascinated by the trail since, although obviously not doing anything about it. A few months ago, I came across Jennifer Phar Davis’ Becoming Odyssa and ordered that to check out. I am very much one for travelogues and adventure stories, even more so if they’re written by women, and even more so if the women are solo. I like to dream big and I find their experiences inspiring. But more on the books later. Caz and Scott and I parked in the lot on Rt 311 where the AT passes through, and could go one direction to Dragon’s Tooth or the other to McAfee Knob. We chose the knob as it was a longer hike, 3.5 or 3.7 miles to the summit depending on which sign you believe. The conversation soon turned to the feasibility of thru-hiking as we went along. Scott recently finished his masters in forestry and his job will be running out in November. Caz is working on her PhD in wildlife and fisheries science and will be at a similar turning point in May. They just got married last month and have been trying to figure out what to do / where to live in the future. I have been getting tired of all the overtime and travel required by my job lately, and some recent organizational changes were making it worse. I could be ready for a change. Generally, thru-hikers start in Georgia in March or April, but Caz pointed out that if you started in Maine you could wait until June. March seemed awfully close but June seemed much further away, leaving me plenty of time to explore job options, save lots of money, and prepare for a thru-hike. For me at least, it started to become not just idle talk, but something to seriously consider. By the time we had made it from the parking lot at 2,000 feet to the summit at 3,197 feet, we had discussed such things as potential trail partners (how many people do you really want to spend 6 months hiking with? possibility to have a partner to just meet up with at night, hiking at your own pace? what about traveling solo? ), hair styles (do I have the head shape to carry off a buzz cut? if not, wouldn’t looking slightly mannish be a plus? ), cost (if I spend $200/month now on food, shouldn’t it be cheaper on the trail? ), physical fitness (as the current incline is making me out of breath and I generally sit at a desk all day for work, wouldn’t I need to start training immediately? must get to Old Rag soon! ), and philosophy (doesn’t thru-hiking result in epiphanies?). I did some loose calculations in my head and started thinking that by the end of May, I’d be able to bump my savings up enough to live on the trail for six months and then off the trail for another six months to a year, and at my current level of monthly bills so not really changing much. This could really happen! Regarding my physical fitness, I’m not in the best shape. I’m not overweight but neither I am super thin and toned looking with no effort any longer. Those days were left in my early twenties. I also no longer live in a city where I walk or ride my bicycle several miles a day just to get anywhere. I moved out of the city to a town where everything is within walking distance, but as I really don’t need to walk into town much, it’s kind of a moot point. Every so often I get the urge to exercise or run on a regular basis but that urge generally leaves me after two to three weeks of getting up early. Recently I’d been considering trying out the Couch to 5k program as a way of getting back into running without starting too fast and injuring myself or making it too painful to enjoy. Now with the motivation of training for a thru-hike, I decided to start as soon as I got home. We also wanted to reschedule the Old Rag hike to November, and the elevation change is almost double what we had just done, so I figured running would get my lungs in shape before then. I’ve been camping and hiking for most of my life, but it’s not actually that often due to life and work and other hobbies getting in the way, not to mention that it’s hard to match schedules with other people who also enjoy this type of thing. I started backpacking several years ago but what that really means is I’ve been on only three backpacking trips – a one-nighter at Round Valley Recreation Area in North Jersey (now closed) with my dad and friend Steve where we did just about 6 miles each way; a two-nighter with my cousin Sarah, her husband Brian, and his colleague Suzie in the Uwharrie Lakes Region in North Carolina where we did a little over 16 miles total; and most recently, a one-nighter in Wharton State Forest in South Jersey with my friends Erin and Amy where we did 5.7 miles each way. I still (perhaps incorrectly) think of myself as experienced though, and I do have all the gear needed. If I were to thru-hike, I might be tempted to upgrade some of my gear; for example I’d probably want to pick up a lighter tent, a smaller sleeping bag, and a less bulky fleece or jacket. However, I could certainly do it with what I have now. I’ve been on a lot of trips this year and I had started to give some thought to making my “big” vacation next year a longer backpacking trip. A colleague had recently told me about the Long Trail in Vermont, which looked awesome but a bit too long to fit into my standard two-week vacation. Perhaps just a section? After looking around, I realized there really are a lot of long distance trails in the country. The closest long-ish trail to me is the Batona Trail, 49.5 miles through South Jersey. I’ve done sections of it in day hikes before but I was thinking of doing that by myself in a four day weekend as training for a longer trip next year. High mileage days are more than possible as South Jersey is ridiculously flat, rarely even a hill to be seen anywhere. Now I wanted even more to do that, not only as training, but to see how I’d do by myself for a few nights. I have done other types of solo trips before, and I generally do quite enjoy my own company, so I’m not especially worried about it. It is always good to prove yourself though. These were all things I was thinking about before starting any research on the actual logistics of doing the AT. I couldn’t stop thinking about it as I drove the seven hours home on Sunday, and immediately upon arriving home, I jumped on my computer to find out more information. My mind has been going in a million different directions with it since then so I thought a journal would help me gather my thoughts. I am a fan of handwritten journals but I thought a blog would be more suited to this for several reasons: a) maybe I’d want to share it later, although for now I definitely wanted to keep it private, b) my thoughts really are all over the place so it’d be hard to write linearly on the subject, c) there is a lot of information online I want to keep track of also, and d) I have no empty notebooks currently in my house. So here I am, trying to keep track of my planning, my thoughts, and my overall progress.